This is our latest favorite comfort food. It's a very "bare-bones" risotto, using the bare minimum of ingredients. 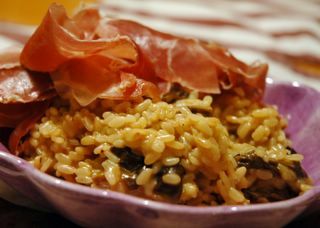 You can certainly add stuff - in the picture above, there are some gently fried funnel chanterelles added along with a few slices of serrano ham, but frankly, I like the plain version better. It's just so very satisfying! And Taleggio is the perfect cheese here - soft and creamy, but with plenty of flavor. You can add parmesan, you can add butter - but you dont have to. At all. Stir in the cheese, and season with honey, lemon and a little bit of chipotle sauce. Use regular chilli powder or cayenne pepper if you can't get chipotle, but the lightly smoked flavor really works here. My god, this is absolutely delicious! I followed your "serving suggestion" and pan fried some chanterelles and mixed that in at the end, and served with strips of Serrano ham. The Tallegio just explodes in this dish. Top marks for this, ten out of ten! Oh yummy! 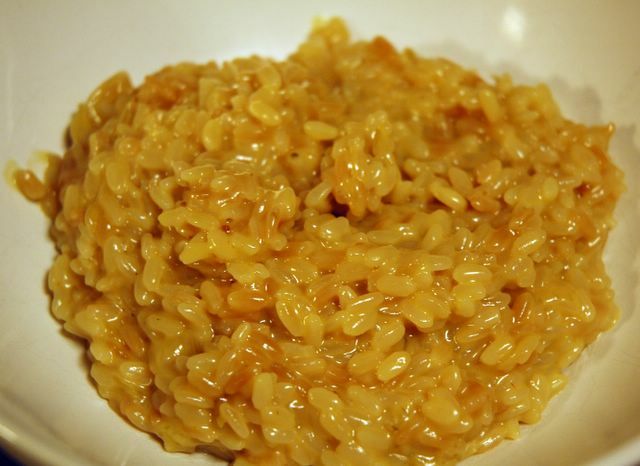 I love any kind of risotto, but this sounds so good! Henrik, oooh! I'm so glad you like it :) I was completely amazed first time I had it, plain. Then I went with the additions, and then it's back to plain. In fact, I can't wait to make it again. Total comfort food! kristen - do try! It's so simple, but really terrific! I must admit I was a bit sceptical to the Taleggio when I diced it - it is a very pungent cheese - but it mellowed down beautifully when melting into the stock. Definitely a keeper, this one; I encourage EVERYONE to try this! I love how versatile risotto is, this looks so creamy! Just want to echo the other comments on this page. Try this! Made it today, it was delicious! I found your blog by chance, looking for recipes to use a big piece of Taleggio, and tried your recipe for lunch today. the combination of taleggio, honey, and chipotle sauce is pure genius! delicious!